QTY 123456789101112131415161718192021222324252627282930313233343536373839404142434445464748495051525354555657585960616263646566676869707172737475767778 Please select a quantity. STYLISH DESIGN- The lamp body features clear faceted crystal glass columns stacked on shiny chrome finish metal. The elegant silhouette is a stylish touch in your entryway, living room, bedroom, office, or any area of the home. 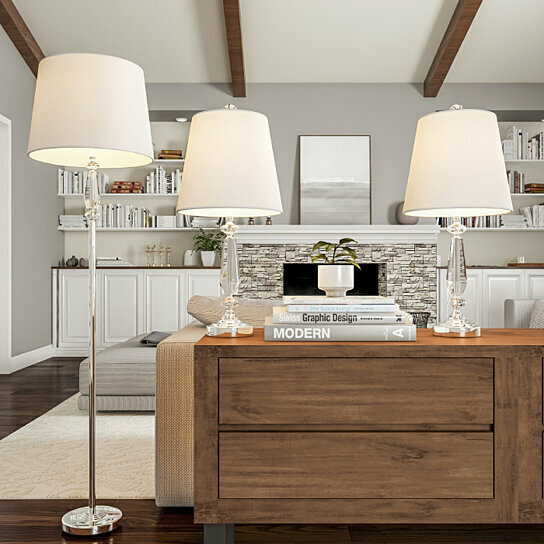 SET OF 3- With two table lamps and one floor lamp included, you can place the lamps separately in multiple rooms or utilize the full matching set in one room for a more glamourous look. The included ivory shades are sure to complement any d�cor. ENERGY EFFICIENT LIGHTING- The set includes 3 replaceable 60-Watt equivalent 802 lumens 9W LED light bulbs. The bulbs are ETL listed and each has a 25,000 hour life span. ATTRACTIVE AND DURABLE- The UL listed lamps are constructed with high quality materials and are built to stand the test of time. These lovely lamps will beautifully illuminate your home for many years to come. PRODUCT DETAILS- Materials: Lamp Base and Stem-Metal and clear Crystal, Shade-Polyester/Cotton blend. 2 Table Lamp Dimensions: (L)11�x (W)11�x (H)24�; 1 Floor Lamp Dimensions: (L)16�x (W)16�x (H)61�. Shade color: Ivory. LED light bulbs included.